I Buy Way Too Many Records Dot Com: Record Store Day Haul #1: The Thermals - Hey You 7"
Record Store Day Haul #1: The Thermals - Hey You 7"
Every year it seems like Record Store Day has fewer records to offer me. It's gone from a neat little thing where there were a bunch of cool records to buy, to something that leans way to heavy on reissues for my own personal taste. Sure, there were a few really cool records this year. The number of cool records nearly doubled by the Swami releases that came out this year. But as a whole, I can't think of a Record Store Day I had been less excited about. Hopefully they right the ship next year. This 7" that The Thermals have released wasn't one I was able to find at my local store, but my buddy Charles was nice enough to pick me up a copy. I've been a big fan of The Thermals for quite some time, so I needed this record to keep my collection up to date. In all honesty though, I'll probably never listen to it again. 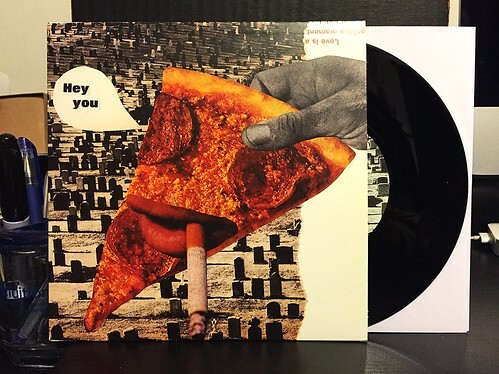 The A Side is "Hey You." which is also on their most recent album. It's a solid little song, but since it is on the full length, it's kind of unnecessary to listen to this side of the 7". The real draw is supposed to be the exclusive B side. The first ever cover song that The Thermals have released: "White Rabbit." Maybe it's because I hate the original song. Maybe it's because an old coworker thought this was her jam at karaoke. Maybe it's because The Thermals don't take their cover anywhere interesting. Whatever the reason, this side of the record may hold the dubious distinction of being the first Thermals song I actively dislike. They have others in the past that maybe I didn't like as much as some of their hits, but this cover is flat out bad. Unless you are like me and would feel a hole in your heart if there was a hole in your Thermals collection, this really isn't worth picking up. I've really gotten turned off by Record Store Day-some of the limited editions are so limited that not every store gets one, yet they can be found on eBay by 9am Mountain Standard (true story-the Utopia limited edition of 500 LP was not received at the store I went to, but there were five copies for sale on eBay at upwards of $100 before my store even opened).